That's not cake, or frosting, and that's DEFINITELY not sprinkles. 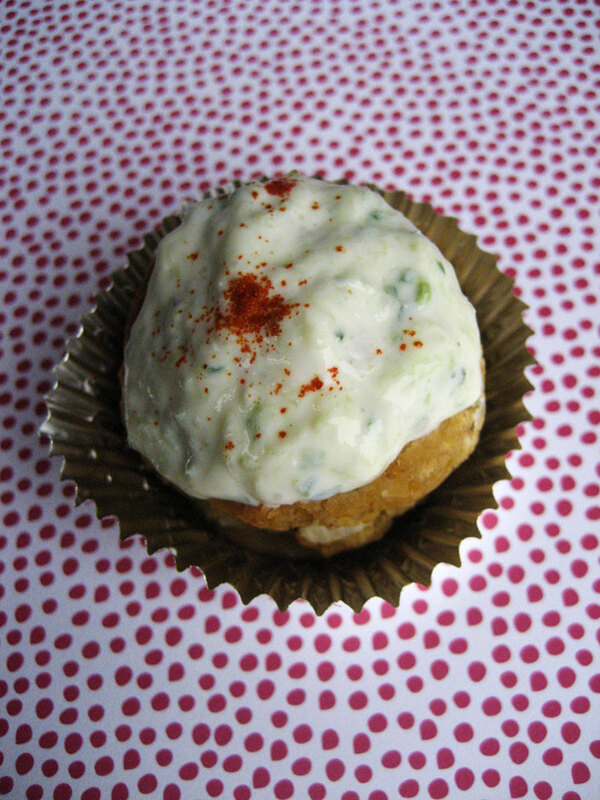 Partially inspired by my recent adventures in yogurt-making, but mostly because of my love for chickpeas, I decided to make falafel “cupcakes.” They’re really just baked falafel in foil cupcake wrappers, with some homemade cucumber-yogurt sauce on top, but they’re tasty and they qualify. Not pictured: totally awesome fluffy pitas, which do not add to the cupcake illusion, hence the non-inclusion. Like most vegetarians (and many omnivores) I really love falafel. It’s awesome stuff. So I thought it deserved a little tribute and a little special treatment. Plus the first and only other time I’ve tried to make them at home they fell apart in the frying pan (and then exploded all over the inside of the microwave when I heated up the leftovers of what I’d managed to salvage). 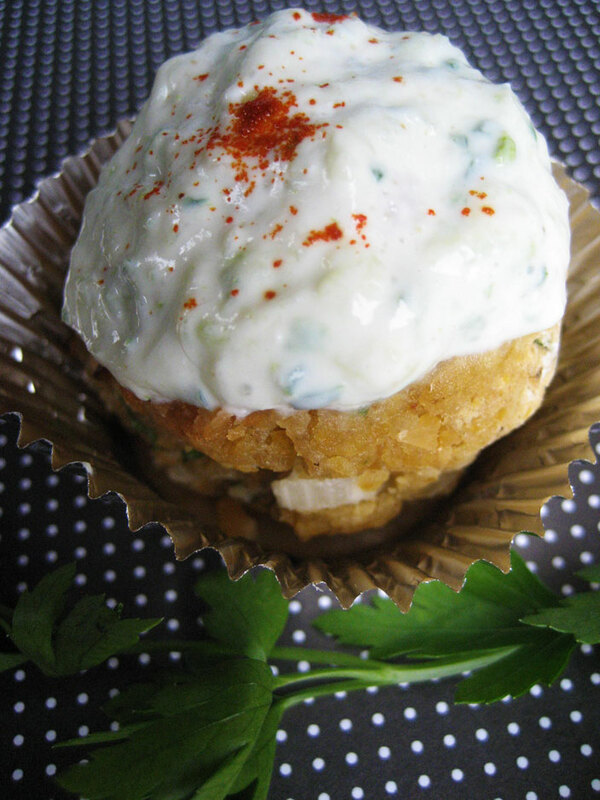 Parsley, chickpeas, cumin, yogurt, cucumber...what more could you want? I’m going to make another batch of these in the next couple days and may season them a bit more. I don’t think I’d feel that way if I hadn’t had some crazy-flavorful falafel in New York. You can’t really buy fresh falafel around here so making my own is my only option. Fresh parsley goes a long way towards helping, as does copious amounts of cumin. And then there’s the super awesome yogurt sauce. 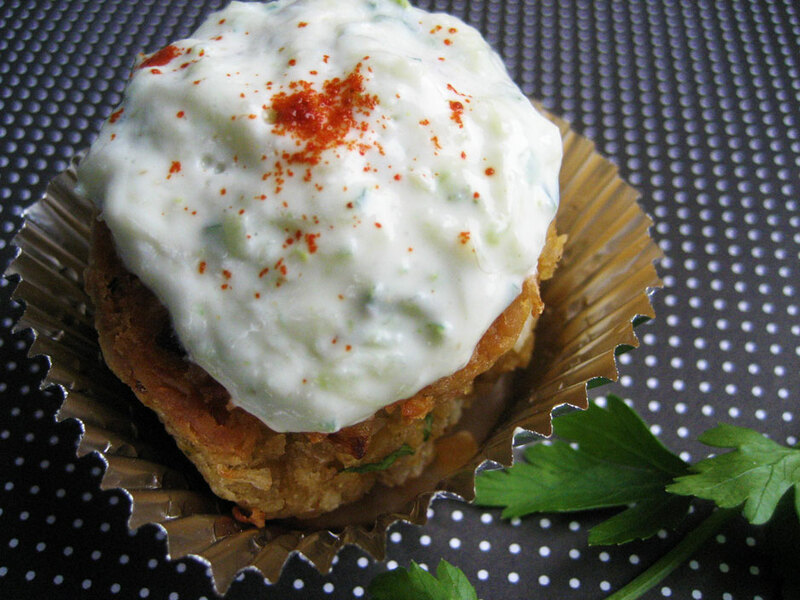 Which I will definitely be making with every batch of falafel from now on. Preheat the oven to 350. Drizzle the oil in a large, shallow baking dish and set aside. Mash the chickpeas and blend in the onion and garlic. Add the remaining ingredients to form a thick paste. Shape into golf ball-sized balls and place, evenly-spaced, inside the baking dish. Bake 18-22 minutes, turning halfway through baking. Place on a plate lined with paper towels to soak up excess oil. Combine all ingredients except paprika in a medium bowl and mix well. Keep refrigerated. 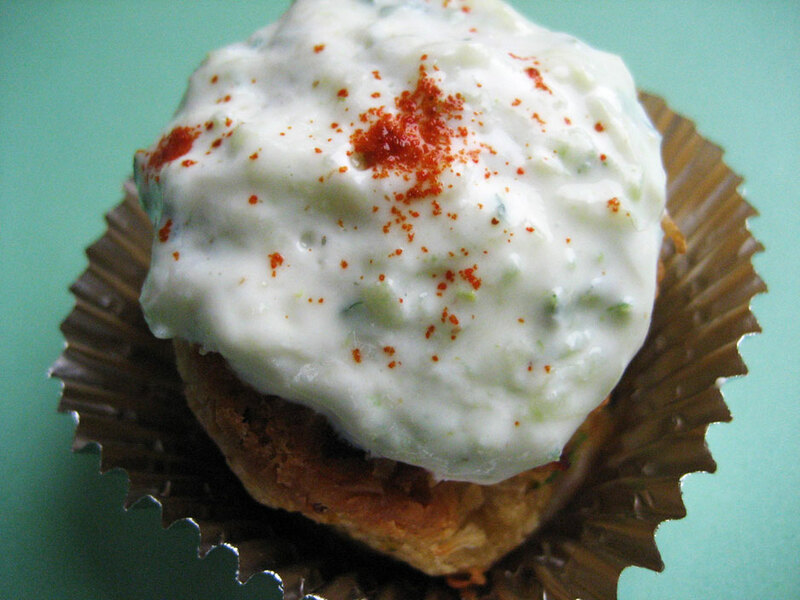 Place each falafel ball into a small foil cupcake wrapper and top with a generous amount of yogurt sauce. Sprinkle with paprika. I am planning on a second entry this month (with actual cake involved!) but it’s going to take a bit of experimentation. There are components I need to make for the first time, not to mention I don’t have the proper equipment to make the kind of cakes I want. It’ll be an adventure! That is such a creative, unique, savory cupcake! Love the flavors as I LOVE falafel! it is AWESOME!!! This cup”cake” for sure is amasingly delish! That would be a fun item at a dinner party. Can’t you see your guests’ faces when you put down a cupcake in front of them for the entree course? How fun that would be!